Expression Blend 4 provides Intellisense in its code editor in the same way that Visual Studio 2010 does. It offers suggestions for next elements that make sense in the current context. Intellisense in Blend is a little less rich than the version in Visual Studio, offering suggestions a little less frequently. But it does suggest available methods and properties for objects. 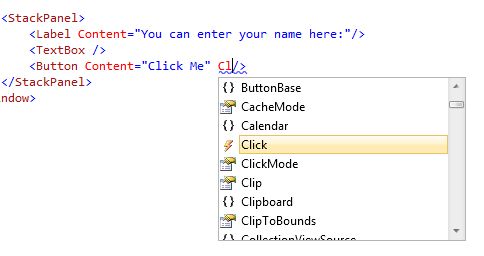 Blend also provides Intellisense in its XAML editor, suggesting elements and attributes. Notice that it provides a little more information than Intellisense in Visual Studio, when editing XAML. Unfortunately, Blend’s version of Intellisense will not suggest events for XAML elements. Within the context of an element, only its properties are listed. 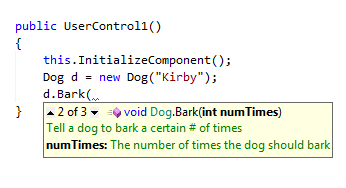 You’re better off adding events using the property pane in Blend, or using Visual Studio 2010 to add event handlers. The version of Intellisense in Visual Studio 2010 does suggest events.